MHSolutions is an American and Chilean company with offices in both countries, dedicated to the execution of bulk material handling projects. The MHSolutions logo is balanced, deliberate, and clean-edged. Its composition promises strength and precision, just like the engineers it represents, while the colors pay homage to the earthy deposits that the company mines. Not shown in the above document, is the reflective copper-foil stamp that gets added to the card after printing. The foil covers the word "SOLUTIONS" and the bottom tongue of the "MH" logo. They shine when the light catches them — which is, again, reminiscent of minerals. 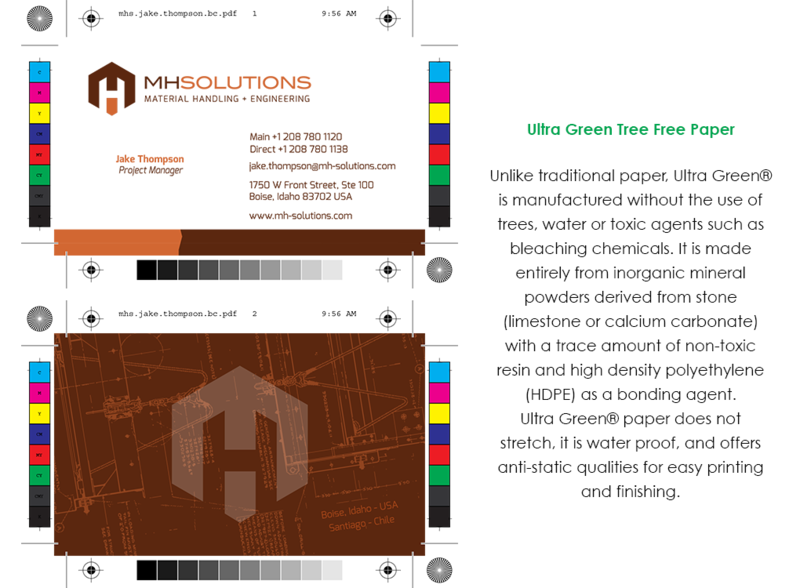 MHSolutions business cards were printed on a unique type of stock [see above Ultra Green® desc.] that is smooth and soft to the touch, despite being thicker and more wear-resistant than typical paper stocks. When you're handed this card, you remember it. MH-Solutions.com is a bilingual digital platform. 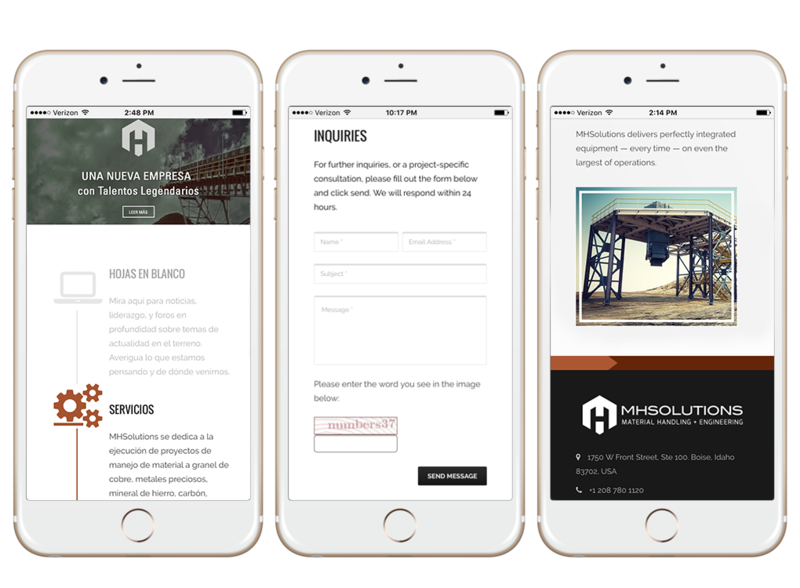 Responsive design, combined with photos from the company’s past projects, help to illustrate their competencies immediately. 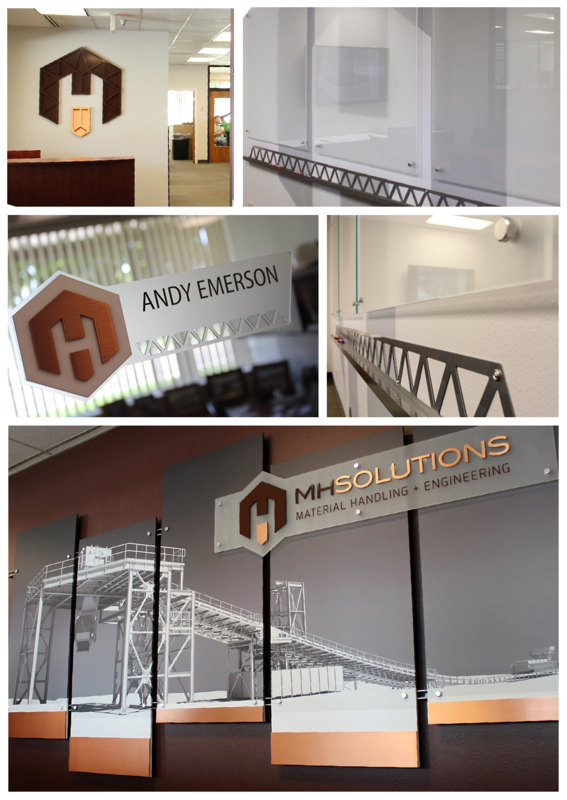 c308 collaborated with Trademark Signs to develop branded elements for the MHSolutions offices. Our most notable contribution was a computer generated image, painstakingly rendered from actual AutoCad design files.